Barleycup is a caffeine free drink by nature, meaning that none of its ingredients contain caffeine. That is why Barleycup drinks are perfect for those who look for a natural alternative to coffee. A large number of consumers are unaware of the fact that caffeine is present in other products, in addition to tea and coffee. Caffeine can also be found in chocolate, energy drinks, dietary supplements and certain medicines – it is often found in over the counter painkillers. According to specialists, if consumed moderately, caffeine is not harmful to health. 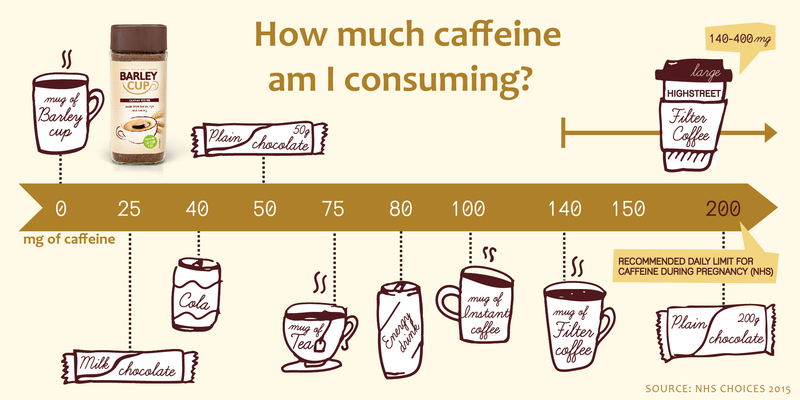 It is reported that a safe amount of caffeine consumed per day by an adult healthy person should not exceed 400mg1. This is roughly equivalent to four cups of instant coffee. 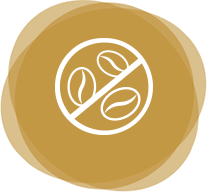 According to our research, carried out on a sample of 2,000 consumers in the UK, every third adult (35%) drinks more coffee every day than the suggested daily limit. Considering a medium Americano from a high street coffee shop can include as much as 277mg of caffeine , this may mean that people are unaware of the amount they are ingesting into their bodies every day. Barleycup is the ideal alternative – offering a natural coffee like beverage with no caffeine, making it the perfect bedtime drink. Barleycup is also suitable for those who have had to give up coffee for health reasons.